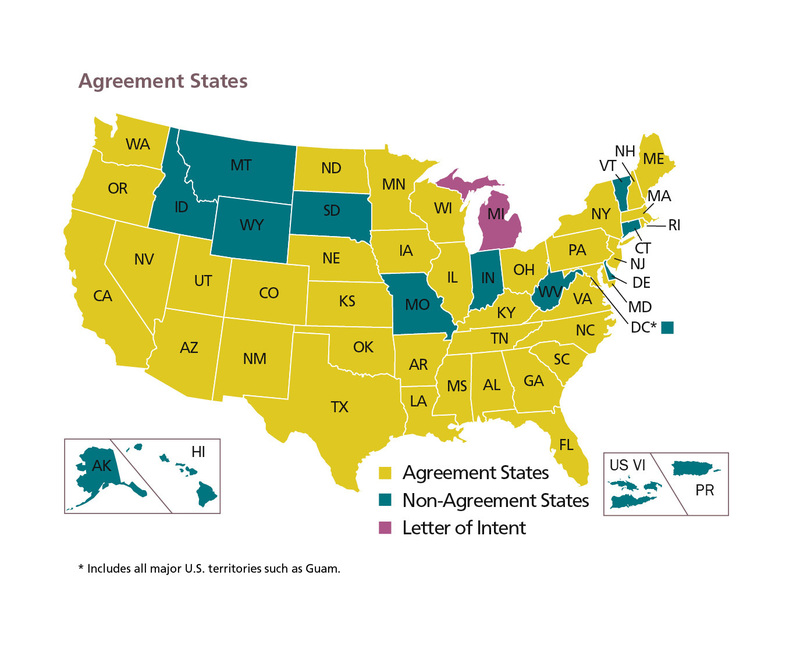 Thirty-seven states have chosen to go this route, resulting in about 19,000 or the 22,000 material licenses nationwide falling under the jurisdiction of Agreement States. The other roughly 3,000 material licenses remain under the authority of the NRC. Toward this end, the NRC in 1994 designed and piloted a new review process for Agreement State radioactive materials programs called the Integrated Materials Performance Evaluation Program, or IMPEP. In 1996, the NRC began full implementation of IMPEP. So how exactly are these evaluations carried out? One of the first steps is to ask the Agreement State program being reviewed to respond to a questionnaire, which asks detailed questions about the program. Another initial step entails having qualified inspections accompany the program’s inspectors to assess their performance. Next, a thorough on-site examination of records and interviews of program personnel are conducted. Once the on-site review is finished, the IMPEP team – made up of NRC staff and experts from Agreement States other than the one being evaluated — issues a draft report of its findings to the program undergoing scrutiny for any comments on factual accuracy. Any comments received are then dispositioned and a proposed final report is issued. A public meeting of a Management Review Board (MRB), which is comprised of senior NRC managers and an Agreement State manager who serves as a liaison, is held. At this session, the MRB reviews the proposed final IMPEP report and renders a final determination of the program’s adequacy and compatibility. After this meeting is held, and the evaluation is finalized, the NRC issues a final report to the Agreement State that was reviewed. Those reports are made public in the NRC’s electronic document system. Each day in the United States, radioactive materials are used for purposes that include the treatment and diagnosis of diseases, making food safer and industrial applications, such as detecting oil in the ground or cracks in pipes. The Agreement States, in conjunction with the NRC, work to ensure those uses remain as safe as possible for the public and for the environment. US is using radio active materials in a very efficient manner.US as always is showing the way to other nations in world. @Annu vu Here I completely agree with moderator.There were no official signs of NRC involvement with licensed radio active materials at china basin. The China Basin area in San Francisco was apparently built partially on an old landfill, but there was no NRC involvement with licensed radioactive materials at the site. If you have concerns about what may have been buried there, we suggest you contact the Radiologic Health Branch in the California Department of Public Health – that’s the office that regulates radioactive materials in California. What are your guys knowledge on the radioactive material down by China Basin in San Francisco? Reports are coming out that there is radioactive material buried beneath the newly built high-rises, which is really unfortunate because I just began working for a startup, Searchmanipulator.com, which is DIRECTLY ABOVE it. Apparently it use to be a huge shipping yard area and they were lazy about dealing with radioactive waste. Now, people are demanding that they do tests, but the land owners are refusing because they know what is under there. How unsafe is it to work there? Thanks for the transparent explanation! Previous Previous post: The Near-Term Task Force Report – Readable for all?